"Bone Remodeling and Fracture Healing" - "What does the brain have to do with the bones?" 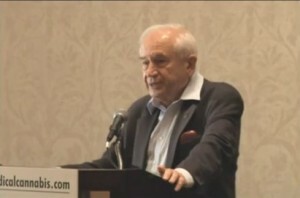 asks Professor Raphael Mechoulam, Phd of Hebrew University. Having noted changes in bone structure in brain-damaged patients, with improvement in broken bones and osteoporosis with CB2 agonist; a study showing Greek women have 50% less osteoporosis than northern women, with consumption of olive oil cited as the reason, Dr. Mechoulam wondered, "Could Oleac Acid have something to do with the bones? ", having noted its similarity to Anandamide-related cannabinoids. Mechoulam's team looked at Oleoyl serine ("an endogenous anabolic regulator of bone metabolism, stimulating bone formation and inhibiting bone resorption"), finding that it reduced ovariectomy-induced bone loss. Citing a recent study finding that "chronically administered phytocannabinoids (5 mg/kg/day each of THC and CBD) markedly stimulate the mechanical properties of healing fractures, through enhanced mineralization", Dr. Mechoulam concludes that "Together with cannabinoids, the skeletal activity of Oleoyl serine suggests an important role for fatty acids in the regulation of bone metabolism".